This series was made in April 2016, exactly one year after the Ghorka earthquake shook Nepal. 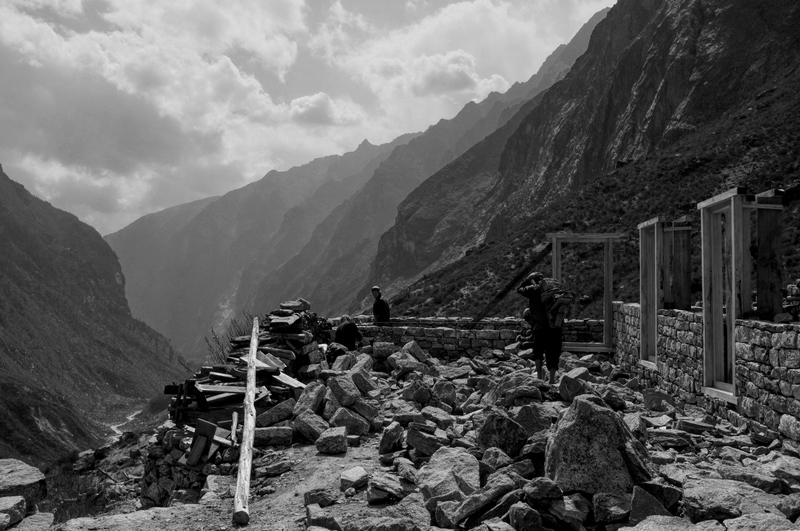 With a 7.8 magnitude, it triggered a large landslide that buried the village of Langtang, situated in a narrow valley around 4000 meters high, on the Nepali border with Tibet, a short distance North of Kathmandu. The valley sits next to a very steep ridge, bellow a glacier. The earthquake caused an enormous chunk of ice to snap off and slam onto the valley’s floor. This created a pressurized blast strong enough to flatten the trees up the mountain on the opposite side of the valley, leaving hundreds of fallen trunks arrayed in the same direction. 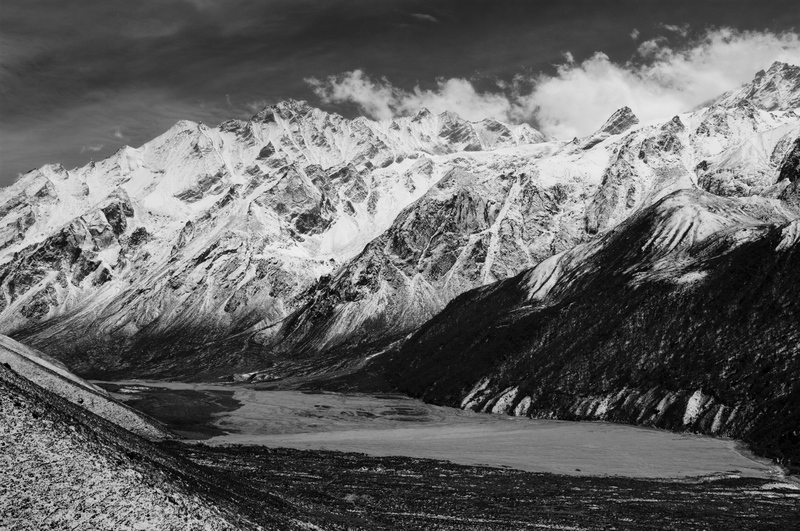 A large snow field fell right above the village, burying it underneath a 30 meter layer of rock and ice, in which 285 people from various nationalities died or went missing. There are no roads up the valley. All the goods are carried to the existing villages by foot, sometimes with the aid of donkeys. Helicopters can land in the upper part of the valley, even though this is only done in emergency situations. 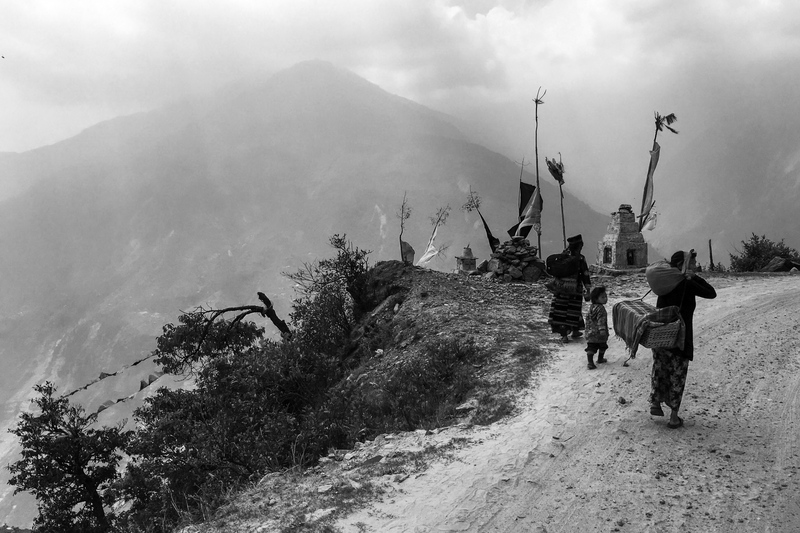 The trail to the Langtang village takes at least 2 days going up the Himalaya from Syabrubesi, the closest village reachable by car. Local men rebuilding a house. Upper part of the destroyed village. 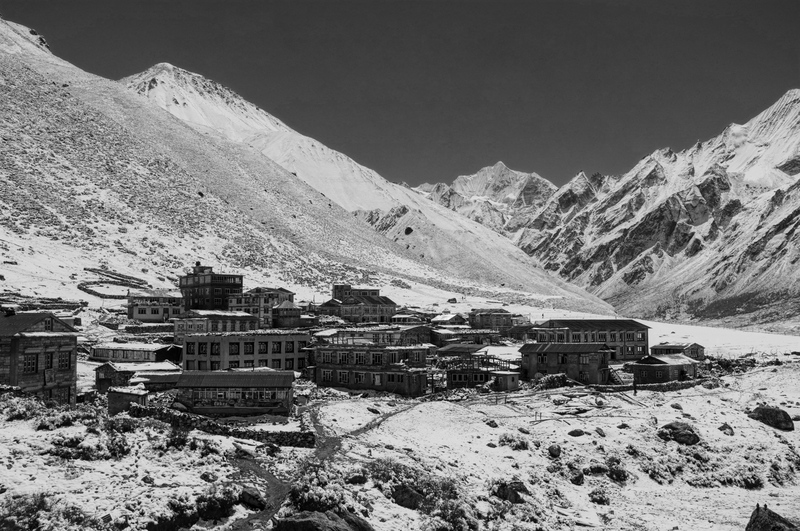 One hour away from Langtang, further up the valley, there is the village of Kyanjin Gumba, which was less affected by the earthquake. 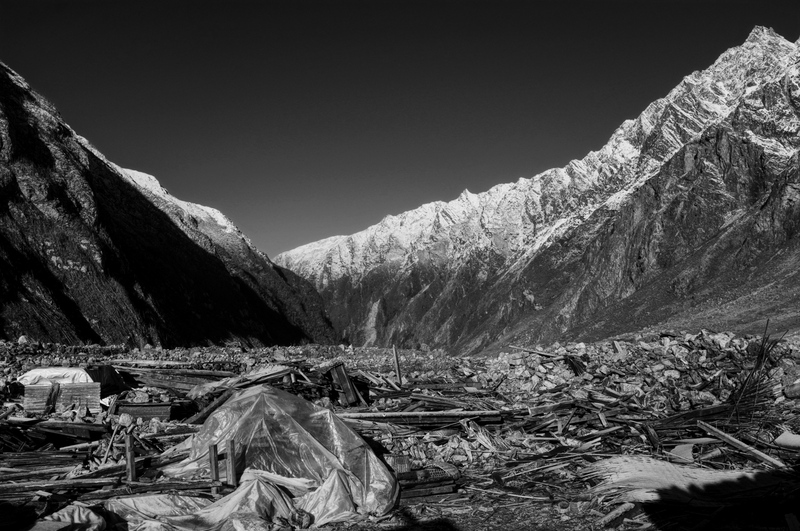 In the morning it happened its inhabitants were the first to reach Langtang for aid, upon seeing the landslide. Sonia, a local young woman, 18, lost all her family in the earthquake and is now married to Baju. 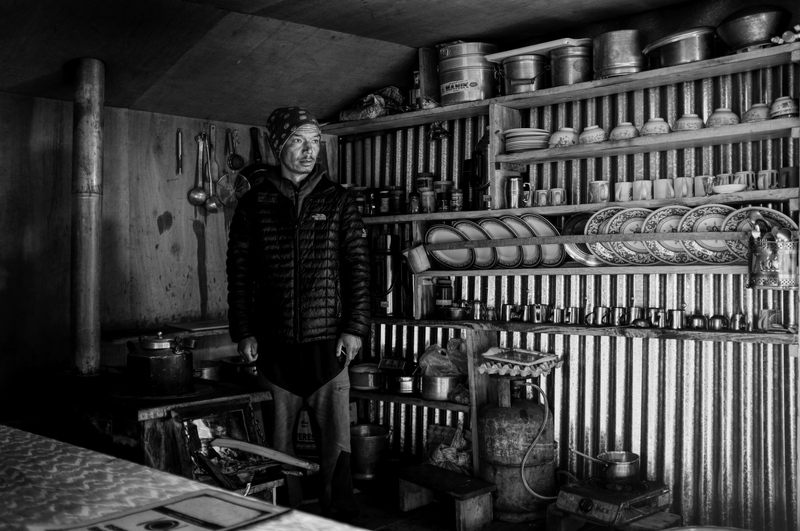 They both live with his mother and run a small guesthouse, used mostly by passing trekkers. Most buildings in the village were deserted. Only a couple of small guesthouses and local yak cheese factories were running. 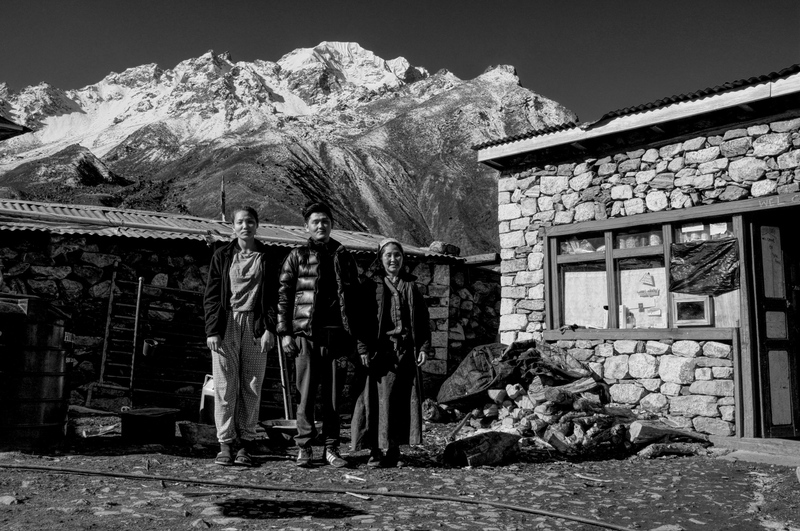 This family said most people in the village would rather work for money than getting donations from the few tourists passing by, and hoped the news that the Langtang Valley is slowly rising up will spread. On the 25th of April, the first anniversary of the earthquake, a small memorial was erected, with inscriptions of all the names and nationalities of the deceised. In the morning, a few foreign family members travelled by helicopter to the village and gathered for a small cerimony around the memorial. The village of Kyanjin Gumba. Sonia with Baju and his mother, in the village of Kyanjin Gumba. View from the mountain beside Kyanjin Gumba. 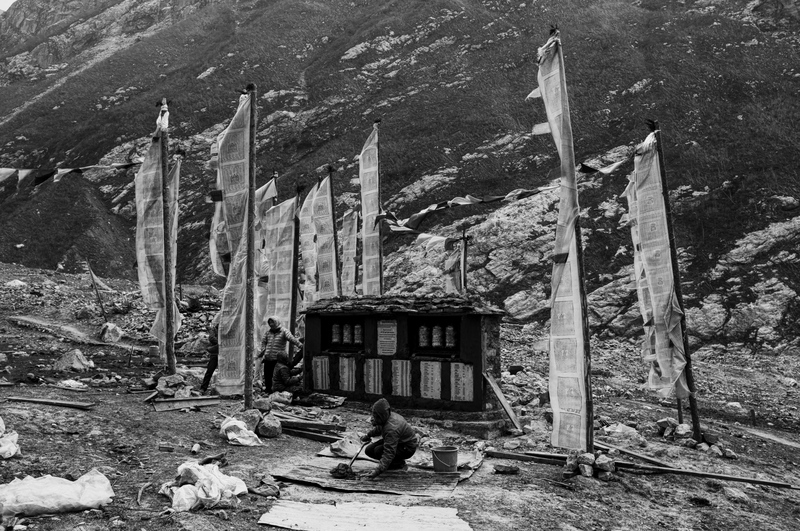 Local men finishing the construction of the memorial, surrounded by buddhist prayer flags. Child, mother, and grandmother carrying supplies, close to Syabrubesi.